Jeremy Tinder is an asthmatic with a bad back. Despite these afflictions he has soldiered on, forming a distinctive style in both cartooning and painting. He lives in Chicago, where he is earning his MFA in painting and drawing from the School of the Art Institute of Chicago. Jeremy has taught comic-making and life drawing classes to punky kids at a Quaker boarding school in Iowa, where he was often awoken in the middle of the night by the sounds of turkeys climbing on his roof. Jeremy's interests include videogames and pretty girls. 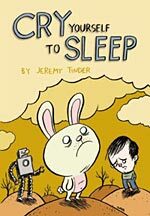 His Top Shelf debut was the popular graphic novel, Cry Yourself To Sleep, and his latest release, Black Ghost Apple Factory, is a great collection of touching and humorous comics.